We explore how culture, society, and media influence the formation of beliefs and how social groups influence individual behavior. We review ethological research on the roots and intricacies of cooperation, competition, altruism and group membership. 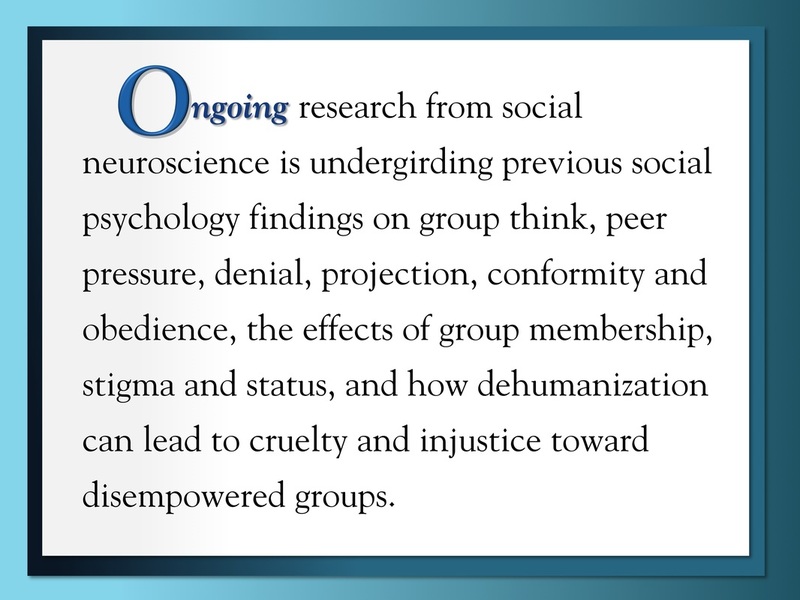 And we reexamine groundbreaking social psychology experiments in light of emerging brain science, including classic studies of obedience, conformity, social collusion, levels of moral development, bias, and denial (Asch, Milgram, Zimbardo, Kohlberg and others). We review the universal human needs for belonging and group identification, and our tendency to stigmatize others in order to increase our own status. With the latest brain research in mind, we investigate common blind spots, fallacies, and forms of self-deception: how implicit bias and unconscious motivations may color perceptions, and hence our attitudes toward others. Social Psychology research has shown how easy it is for us to lie to ourselves; to think we know more than we do and to believe that we are more competent than we are; to deny our actions when they lead to unexpected disaster; to justify our mistakes and misdeeds; and to project onto others flaws that we are unconsciously ashamed of in ourselves. How our decisions, actions and volition are influenced by implicit, unconscious cognition. In the next few years, emerging knowledge about the human brain will have a profound effect on the public’s worldview and the future of society, culture, and policy-making. Brain and behavior science has brought us face to face with our own nature, in both its animal aspects and its distinctly human ones—such as our quirky, story-telling minds. Building upon 2500 years of brilliant debates in moral philosophy, as well as advances in moral psychology, anthropology, group dynamics and social psychology and, in particular, the latest studies in social and affective neuroscience, there is an entire world of research unveiling a deeper, richer of human nature and development. Imaging technologies that map brain activity are providing us with un-precedented insights. We can watch our brains develop, respond to the world, remember, learn, and imagine. We can also see how minds can be damaged by the trauma and neglect that lead to impaired thinking and behavior.